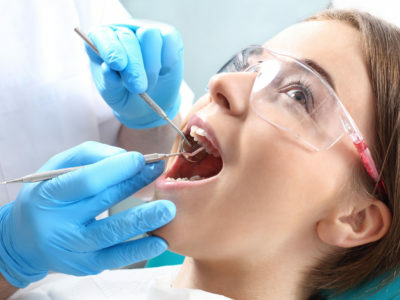 Maintaining healthy teeth and gums encompasses things like clearing built up plaque or tartar from the teeth and checking for cavities, broken teeth, leaking fillings, infection, gum disease, oral cancer, or any other issues. This also includes updating and reviewing dental x-rays. While many wouldn’t associate a regular teeth cleaning with overall health, there have been a number of studies that show a strong correlation between oral and overall health. Poor oral health can lead to complications with the rest of the body. One of the most common issues is gum disease. As tartar and bacteria build up in the mouth, the immune system treats it as a foreign invader and tries to kill it off. 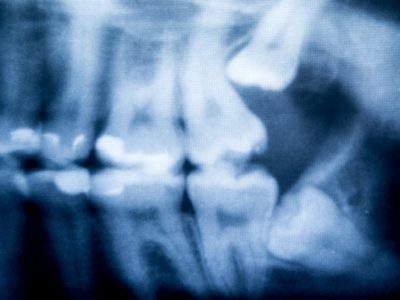 As gum disease progresses, so does the destruction of bone and tissue in your mouth. Your immune system is only built to battle disease for a short amount of time, so if gum disease is not properly treated, it can spread to other parts of the body and increase your risk of stroke, heart disease, and dementia. Gum disease can negatively impact your life expectancy and quality of life. 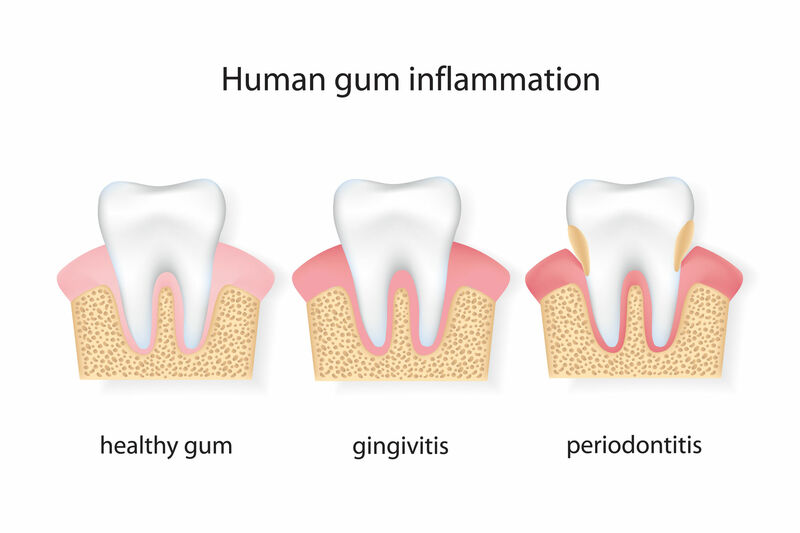 The most common form of gum disease in gingivitis. If your gums bleed when you floss, it’s likely you have gum disease. Healthy gums don’t bleed. After a certain point, damage done by gum disease is irreversible, which is why it’s imperative to maintain your oral health. Regular hygiene visits are a critical piece of prevention. Most teeth cleanings are performed by a dental hygienist. Before they even begin cleaning, they will do a physical examination of your mouth, both inside and out, for any potential diseases. They may touch around your jaw and cheeks to check for unusual lumps or use a small mirror to look around teeth and gums for signs of gingivitis. Next up is the removal of plaque and tartar from the surface of the teeth. The hygienist will use a tool called a scalar to gently remove any built up plaque and tartar. The more tartar in your mouth, the longer the hygienist will take to remove it all. Unlike plaque which can be easily removed through regular brushing and flossing, tartar can only be removed in a dentist’s office. After that, your hygienist will polish your teeth. In this stage, they will take a high powered electric toothbrush and brush your teeth with gritty toothpaste to remove any left behind tartar or plaque. This step is a great way to deep clean the mouth. Finally, your hygienist will give you a good flossing to remove any leftover plaque or toothpaste, as well as to see if there are any sensitive spots in your gums. Once flossing is complete, you will rinse out your mouth to get rid of any debris. Sometimes the rinse used will contain liquid fluoride. The hygienist may also give you coaching or suggestions are areas of your mouth which need attention. The hygienist is a great resource for information related to dental health and total physical health. Your dentist or hygienist may also take pocket readings, which measures gum health. Although it looks like the tooth and gums are connected right at the gumline, they are actually connected much deeper in the gums. This leaves a small pocket between the tooth and the gum, like a moat around a castle. The top flap of the pocket can grow in size due to inflammation, or the ligaments deep down inside the pocket can break down and make the pocket deeper. Regardless if the pocket deepens from the top or the bottom, it’s not good for your oral health. Deep pockets are an indicator of disease but can be prevented with proper oral hygiene at home and regular teeth cleanings. Been a while since your last cleaning? Contact us today to set up an appointment with our skilled team of dentists and hygienists.